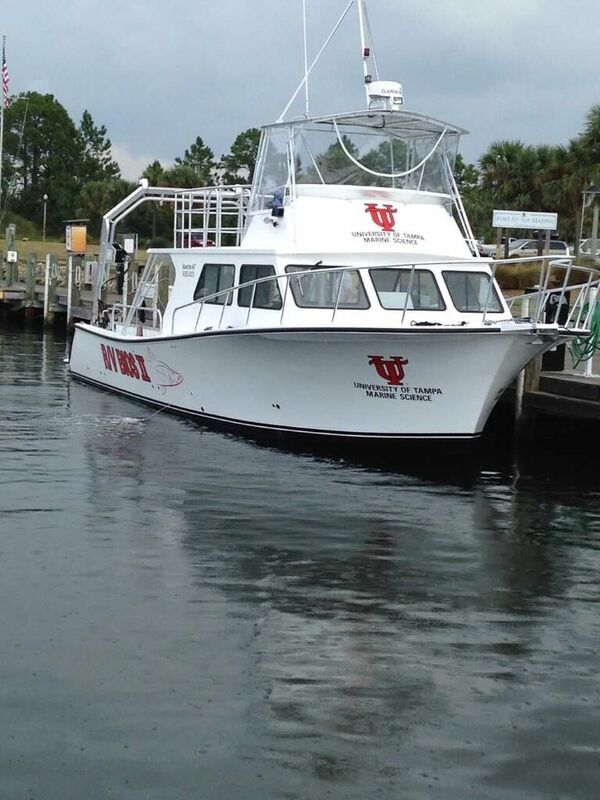 Students of all majors now have an exciting opportunity to venture into the waters of Tampa Bay, go scuba diving and collect samples of marine life, thanks to the BIOS II research vessel. The research vessel is new to UT this semester and replaces the BIOS vessel that UT has used since 1978. Many biology professors noticed it developing several mechanical problems. Dr. Stan Rice, along with others, wrote letters to the UT administration and secured a status report of the boat from a local boat repair facility. Acknowledging the various downfalls of the boat, in November 2016, President Ronald Vaughn gave them the approval to search for a new vessel. “I spent my Thanksgiving break searching for possible used boats or new boats, and we found an organization in Louisiana that builds boats like exactly what we wanted,” Rice said. Once President Vaughn signed off on the boat, they began to build. It was completed this August, but Hurricane Irma delayed its arrival in Tampa until Sept. 22. The boat can seat 30 students and has racks for 24 scuba tanks. Instead of having to pull a large net from the back of the boat by hand, the BIOS II has an A-frame, so students and faculty can more easily retrieve sampling devices from the water. The BIOS II also features upgraded navigation with radar for night time or days with fog. Brand new engines mean it will be smooth sailing for class field trips, and Rice pointed out that both biology majors and nonmajors will have the chance to use the vessel. Rice also hopes to plan trips to go scuba diving on reefs offshore for faculty and students. Emily Williams, a senior marine science and biology major, is excited the vessel arrived before she graduates in December. The boat is kept at the Marine Science Field Station at Bayside Marina, which contains research equipment for sampling and systems for keeping animals alive in the lab. Faculty and students alike are excited about the new prospects the vessel brings. “We appreciate the administration’s willingness to support our program and provide the funds to get this boat for our students and faculty,” Rice said. With the marine science and biology double major being one of the university’s most prominent degrees, the BIOS II has the chance to improve research and study of marine life for hundreds of students at UT.